Some people call it a wind vane, others a weather vane. The word "vane" finds its origins in the Middle English word "faine," dating from before the year 1100 and meaning a flag, standard or emblem. A weather vane, according to the American Heritage Dictionary of the English Language, 4th Edition, is "a device for indicating wind direction." Weather vanes have topped homes, barns, church steeples and public buildings in America for nearly 300 years. In order for the weather vane to rotate freely on its mounting rod, both sides of the ornament--the part that moves--must have the same mass. This does not mean that they are the same size; they are not. It means that the mass of metal--its weight--is divided evenly between two sides of its central shaft. The weather vane ornament must have a smaller area on one side of the central shaft than on the other. 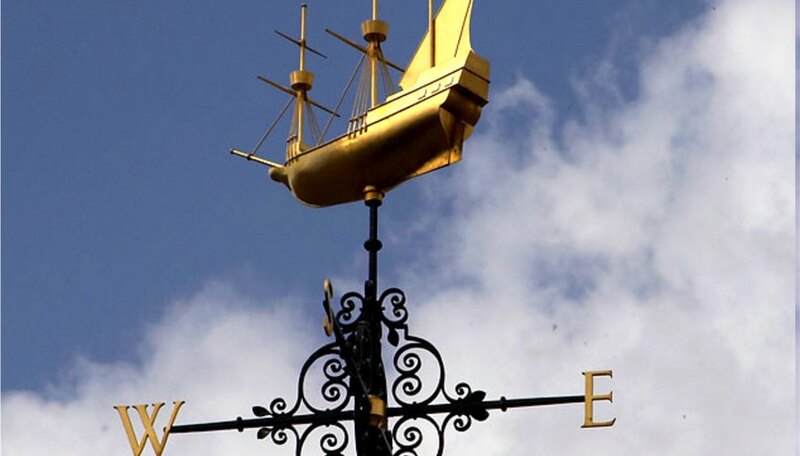 While both sides of the weather vane's ornament have the same mass, one side must have a greater overall "sail area," to catch the wind and move the side with the smaller sail area to point into the wind's direction. The business end of the ornament, called the pointer, always points into the wind, whether its shape is that of an arrow or the head of a horse. The direction indicators, the parts that show north, south, east and west, are pointed in the direction they represent: the North indicator is oriented to the north, the South indicator to the south. Winds are indicated by the direction from whence they originate. A north wind comes from the north, a south wind comes from the south, and east and west winds blow from the east and west, respectively. Certain winds at certain times of the year bring certain kinds of weather; if a sailing ship's captain, leaving his home ashore, saw the weather vane on his roof pointing generally northeast in the late fall, he might delay the ship's departure by a day, to allow the incipient Nor'easter to blow through and leave him with fairer winds. Farmers might hesitate to plant at a wind shifting from a south wind to an east wind, knowing that the summer shower they could smell approaching might settle in and make their fields too wet to plow. The weather vane is not an anemometer. While an anemometer measures the speed of the wind, the weather vane does not. Some modern weather vanes do have an anemometer attached, and can be recognized by the spinning set of "arms" that end in cup-like devices, usually located below the traditional wind direction indicator. U. of Michigan Middle English Dictionary entry, "faine"